This is out of date! Please use the Twine wiki instead. Having investigated the Twine engine code, I've found that the official passage syntax documentation(*) is incomplete. Here, then, is what I believe to be a complete list of Twine markup syntax. Almost all of it is derived from TiddlyWiki, and as such, some parts are not necessarily relevant to the typical Twine author. Nevertheless, they remain available. Twine's engine is largely based on TiddlyWiki. The standard formatting codes are all TiddlyWiki syntax. Though, having a closer look at the engine source, I discovered a few other TiddlyWiki formatting codes are present in Jonah and Sugarcane - most interesting being Inline CSS, which ostensibly lets you apply inline styles around passage text. All you have to do is type "@@", then list CSS style attributes separated and terminated with semicolons, then put the passage text (including any other formatting and macros) ending with another "@@". You may notice that this is all functionally equivalent to simply writing raw HTML: <html><span style="background-color:hsl(30,50%,50%);">This text has an umber background.</span></html>. Except, being in HTML mode prevents you from using wiki syntax, internal links and such, so this method is both briefer and more consistent with Twine markup. If you want to easily apply CSS to an entire group of passages without needing to copy-paste CSS code, then you can use this method and script code to do so. The Rewind menu in the Sugarcane story format only displays previously visited passages that have been given the tag "bookmark". Fig. 1: Anna Anthropy's "Town" after certain passages were given the 'bookmark' tag. Of course, since the player can already step back through their entire game history using the browser's "back" button, the utility of the Rewind menu is somewhat questionable. 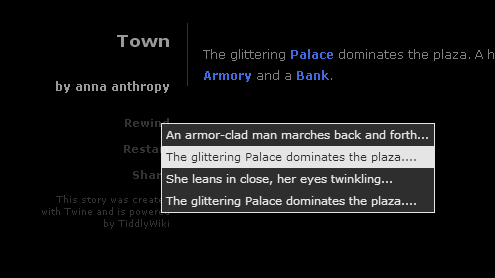 And, of course, games that use the <<display>> macro heavily (such as Town itself) will not benefit well from it (unless, perhaps, you use <<addtag>> in the displayed passage to add the bookmark tag to everything that displays it???). Bug: a bug in the current version of Sugarcane means that the Rewind menu will stop working if one of the bookmarked passages has less than 7 words in it. Just so you know. I have updated the code snippets for applying CSS to passages with specific tags to include being able to select the body element of the HTML document. I have also updated these tag-related macros to match. Howdy. The name's Kit. I've been trying to work out how much you can make Twine do that isn't just display the characters you typed in different ways. I'm working on a battle simulator, and I realised that to make it look computer-gamey, it would need health bars. How does one make a bar chart in Twine, anyhow? Well, after a few hours of poking, I can suggest that this is one way - well, three ways. It's best to read them in order, but it's ok, they get simpler. They are all built around the idea of recurring a passage using an if condition nested inside itself, as suggested here. These bars run using the passages Outer 2 and Inner 2. The bars work exactly the same as in Method 1, except the symbol is not specified. It is "|", hard-coded into Inner 2. If you always intend to use the same symbol, the code should run slightly faster if you use this method rather than that shown in Method 1. This is the simplest version of my bars to use. The only variable that has to be specified is health, which will be the length of the bar. Outer 3 has been simplified because of this. There is one bug I have found - if I try to display a bar of length zero, not only will it not print a bar (which is what I'd like), it also won't print the number 0. I have no idea why this is, but if anyone does, any help is appreciated! If you want to see these running, go to the barchartdemo listed below. Similar to my <<replace>> macro, this code causes the passage text in between the <<timedreplace>> and <<becomes>> tags to be replaced with what is between those and the <<endtimedreplace>> tag, after a certain amount of time has elapsed. * <<timedinsert>> causes its text to be inserted into the page. It doesn't need a <<becomes>> tag to function. * <<timedremove>> works in a matching fashion, removing its contained text after the time elapses. * <<timedcontinue>> is similar to <<timedinsert>> but does not require a final <<endtimedcontinue>> - instead, it causes all subsequent text in the passage to appear. You can also substitute the <<becomes>> tag with <<gains>> to cause the next run of text to appear at the end of the previous run, without replacing it. If you put multiple <<becomes>> or <<gains>> tags in, the macro will make them appear as well after the same amount of time passes. This takes CSS time values, which are decimal numbers ending in "s" (for seconds) or "ms" (for milliseconds). * You search. <<timedinsert 1s>>You find nothing.<<endtimedinsert>>. * 16/06/2013 - Updated regarding Combined Replace Macro Set. * 26/04/2013 - Added timedcontinue. 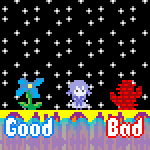 * 05/04/2013 - Added timedinsert and timedremove, as well as downward scrolling. * 07/03/2013 - Made the transition CSS-based. This simple macro produces a usable internal link whose text changes whenever you mouseover it. This uses the << choice >> macro's parameter order - the destination passage name comes first. Then comes the visible label, then the hidden label. For obvious reasons, this won't work on iPads! * The link has a class of "hoverLink" in addition to the standard internalLink/brokenLink classes. * Each text label is a <span> inside the <a>, and the mouseover and mouseout events make one or the other visible. 29-1-13 - Shortened name to "hoverlink"
This extends my code for applying Twine tags to passage divs, and extends on it as a mechanism for CSS selection. What these macros do, in order, is add a tag to the current passage's tag attribute, remove a tag, and toggle its presence (remove it if it's there, add it if it isn't). This means that conditional application of CSS, controlled by << if >> statements, is possible. These are guaranteed to work both inside passages, inside << replace >> macros, and, tantalisingly enough, inside << display >> macros. Interesting, very interesting. 1.1.0 - Now adjusts tags on the body element as well. 1.0.1 - Fixed not working in Jonah. This simply produces a link whose text cycles between a number of values whenever you click on it. It otherwise leads nowhere. You can use it as a silly clicky trinket, a cheap alternative to the <<replace>> macro, or (as detailed below) as an input interface element. If the first parameter begins with the "$" sigil, then it will interpret it as a variable to be altered by clicking the link. When the player visits the page or clicks the link, the variable will be changed to match the text of the link. If the variable already has a string value when you load the passage, then the link text that matches the variable will be selected, instead of the first one. If the last parameter is the word "end", then it will terminate the cycling link at the parameter before last. The containing that text will replace the link element altogether. Similarly, if the last parameter is the word "out", then it will disappear altogether after the final link text is clicked. * You look around, but only see <<cyclinglink "grass" "a flower" "a cloud" "the road">>. - This is a purely cosmetic, endlessly cycling link. * You see a bowl containing <<cyclinglink "3 cookies" "2 cookies" "1 cookie" "a few crumbs" end>>. - This link changes to the words "a few crumbs" when you get to the end. * You see a dial: <<cyclinglink $heat "off" "low" "high" "fearsome">>. - The $heat variable will be changed to "off" when the page loads (unless it was already set to "high" or "fearsome"), and then sets it to "low", "high" and "fearsome" as the player clicks the link. * You see a fuel gauge: <<cyclinglink $fuel "100%" "50%" "10%" "0%" end>>. * You see an air meter: <<cyclinglink $air "********" "******" "****" "**" out>>. Example program 3 (mechanical with CSS).. I've gone to the trouble of writing a number of advanced CSS effects for use with this macro. You can see them all and obtain the CSS code for them by clicking here. These use some very recent CSS animation features in unusual combinations, but they've been tested in both Chrome and Firefox. * For CSS users: the <a> tag has the class names "cyclingLink" and "internalLink". * Each option is a <span> inside the <a> tag. Clicking it causes the next one down to have the class "cyclingLinkEnabled", and the others to have the class "cyclingLinkDisabled". New: on passage load, each option also has the class "cyclingLinkInit", which is removed as each is clicked. * When you click, the "data-cycle" attribute of the <a> tag increases by 1 (wrapping around to 0 at the end). You could select this with CSS, I guess, using [data-cycle=1] or somesuch. 9-8-13 - Added 'cyclingLinkInit' class support. 27-3-13 - Bugfixes, added "out" parameter. 27-2-13 - Added CSS hooks and the "end" parameter. 26-2-13 - Added new variable-setting ability. 16-2-13 - Fixed typo preventing it from working.